William Reese. America’s Public Schools: From the Common School to ‘No Child Left Behind’. The Johns Hopkins University Press, 2005. 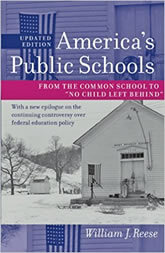 A thoroughly revised epilogue outlines the significant challenges to public school education within the last five years. Reese analyzes the shortcomings of “No Child Left Behind” and the continued disjuncture between actual school performance and the expectations of government officials. He discusses the intrusive role of corporations, economic models for enticing better teacher performance, the continued impact of conservatism, and the growth of home schooling and charter schools.